45% Minerals (clay, silt, sand, gravel, stones). 25% Water (the amount varies depending upon precipitation and the water-holding capacity of the soil). 25% Air (an essential ingredient for living organisms). 5% Organic matter or humus (both living and dead organisms). Mineral particles give soil texture. Sand particles range in diameter from 2 mm to 0.05 mm, feel gritty and can be easily seen with the unaided eye. Silt particles are between 0.05 mm and 0.002 mm and feel like flour. Clay particles are smaller than 0.002 mm and cannot be seen with the unaided eye. Because of the small particle size, clay soils can sometimes experience large amounts of expansion and contraction in volume with changes in moisture content. Water and air occupy the pore spaces—the area between soil particles. The final ingredient of a soil is organic matter. Organic matter consists of dead plant and animal material and the billions of living organisms that inhabit soil. The concern with soil in respect to building is the ability of soil to bear the load of the structure while remaining stable. Ensuring long-term stability requires proper compaction and consolidation of soil before a permanent load is placed upon it. 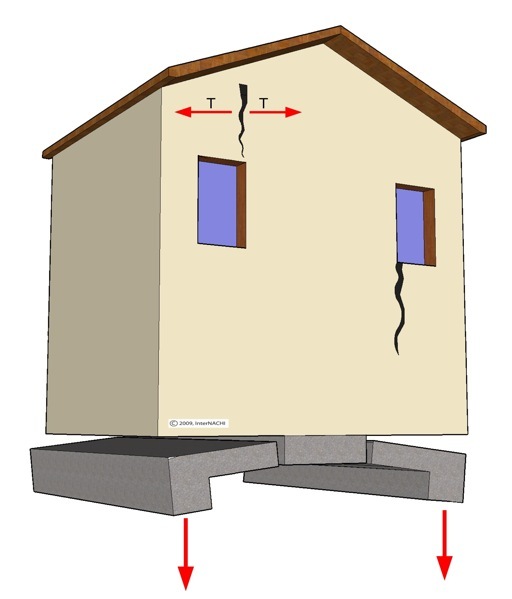 Examples of a permanent load would be foundation footings and walls or a concrete floor or driveway slab. The excavation process disturbs soil, loosening it and causing spaces between soil particles to become much larger. For this reason, engineering specifications often require that foundations be placed on undisturbed soil. 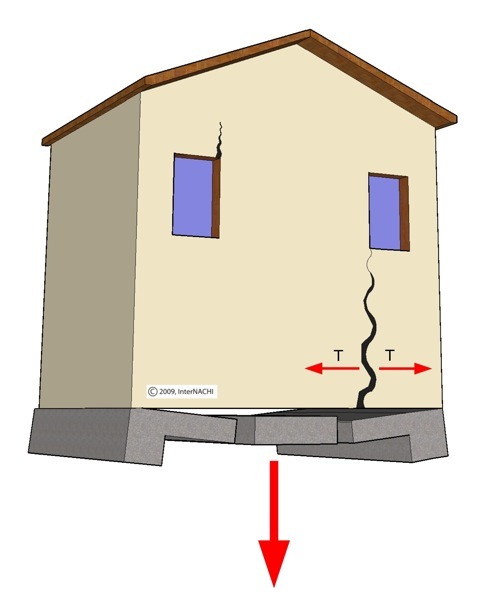 In areas at which a home is built partially or completely on fill, such as homes built on hillsides, that fill must be made as solid as possible before a permanent load is placed on it. This is done by mechanical compaction of the soil. Soil is placed in layers (called “lifts”). Each layer is mechanically compacted by impact and sometimes by vibration. When larger areas such as a hillside lot are compacted, heavy equipment is used. For smaller areas like backfill around basement foundation walls, a jumping jack tamper is used which is operated by one person. Compaction is the process of forcing air from the spaces between soil particles. Compaction with a jumping jack tamper is somewhat inexact. In determining the point at which soil is adequately compacted, the operator listens to the tone of the tamper impacting the soil. When soil is adequately compacted, the tone will have a ringing quality which will not change. A change in tone indicates that compaction is still taking place. Moisture content at the time of compaction. Consolidation is the process of forcing water from the spaces between soil particles. Soil is more permeable to air than to water. This means that the compaction process may remove from the soil a large percentage of air, but a significant percentage of water may remain. Soil undergoes both primary and secondary consolidation. Primary consolidation is short-term and takes place during the mechanical compacting process. Secondary consolidation is long-term and takes place after the compaction process is complete and the permanent loads are in place. During secondary consolidation, the weight placed on soil slowly forces water out of the spaces between soil particles. As this happens, soil particles will move close together and settling will occur. The source of the weight would be both the structure and the overlying soil. The amount of secondary consolidation which can be expected increases with the depth of the affected area. An excavation with backfill 15 feet deep would experience more secondary consolidation than an excavation with backfill 8 feet deep. A common scenario is when a structure is built partially on undisturbed soil and partially on compacted fill. Soil in these two areas will consolidate at different rates as the weight of the newly-built structure forces water from between soil particles. This is called “differential settlement”. Settling will be reflected in any part of structure bearing upon the settled soil. In adequately-compacted soil, settling will be so minor that evidence won’t be visible. Extreme differential settlement will create stresses which are relieved by cracking. Which materials crack depends on the properties of the material and the rate of settling. More brittle materials will crack first. The effects of soil movement are most often seen as cracks in interior and exterior wall coverings like drywall and plaster and in masonry foundation walls. Even concrete, which most people think of as brittle, can bend if pressure is applied slowly over a long time period. If pressure is applied over a shorter time period, concrete will crack. Compaction and consolidation are affected by the composition of the soil. Fine-grained soils have more interior surfac e area and can hold more air and water than course-grained soils. Here's an example. Drywall is made of much courser particles than cement. An ounce of drywall dust contains about 5,000 square feet of interior surface area. An ounce of cement dust contains about 50,000 square feet of interior surface area. This means that fine-grained soils like clays have more interior surface area which can contain water. In order to force water out of the spaces between particles, surface tension must be overcome. "Surface tension" is the tendency of water to cling to a surface. When you fill a glass with water, it's surface tension that makes the water level slightly higher around the edges where water comes into contact with the glass surface. Water is clinging to the glass. The greater interior surface area of fine-grained soils results in greater surface tension. Fine-grained are also typically low-permeability soils, meaning that water moves through them slowly. These conditions increase the amount of time and pressure required for soil to consolidate. Soils will continue to consolidate until the resistance to pressure of the materials of which the soil is composed reach equilibrium with pressure from the weight of soil and structure above. The rate of consolidation is affected by the soil composition, levels of moisture saturation, the amount and nature of the load on the soil and state of consolidation of the soil. Another moisture-related problem is the addition of excessive moisture to the soil. This can create a condition in which water is absorbed into spaces between soil particles. Soil becomes less dense, which reduces its ability to support a load.